Credence Clearwater Revival - 'Who'll Stop The Rain'? And I wonder, still I wonder, who'll stop the raaiinn. "Have you ever seen rain; Comin' down sunny day?" If you *have seen rain coming down on a sunny day the chances are good that you would also have seen a rainbow. I wan' a know, have you ever seen rain? Bin' that way for all my time. ..... The W Lovers are Fleur Wood and Wesley Wood. The second single from 'Ghosts of Cimarron' the debut solo album from Fleur Wood (nee Jack). Video directed by Corey Fleming. Fleur Wood (nee Jack) and The Jandals live on Kiwi FM (New Zealand) in 2011. ... Very smooth sounds Fleur !! In October 2010 this Canadian singer/songwriter reached her funding goal via the 'sellaband.com' website; and was then able to go ahead with the production and publicity of more music and music videos. This is a great live version, with a very good backing band. 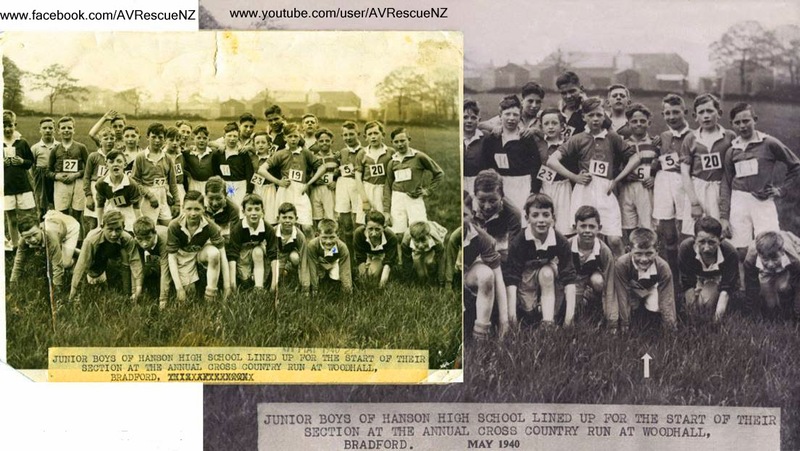 .. Hanson High School junior boys cross-country at Woodhall, Bradford, Yorkshire, England, in May 1940 .. Photograph restored by AV Rescue. ~ Restoration of faded or damaged photographs and documents. ~ Transfer of video from VCR/VHS video tape to DVDs and YouTube etc. ~ Transfer of old slide images to discs and photo paper etc. ~ Transfer of old LP and 45 records to CDs or DVDs etc. Star Wars Death Star Over Copenhagen ! Fantastic video of the Star Wars' Death Star over Copenhagen (capital of Denmark), including Darth Vader visiting Toys 'R' Us !! "At Launch Pad 39A at NASA's Kennedy Space Center in Florida, the seven slidewire baskets travel down to the ground for the final time after being released by technicians from the 195-foot level. The system of seven slidewire baskets at launch pads A and B provided an escape route for astronauts and personnel inside the orbiter or on the orbiter access arm. The baskets are suspended from slidewires that extend from the pad's Fixed Service Structure to a landing zone 1,200 feet to the west. Each basket could hold up to three people. A braking system catch net and drag chain slowed and then halted the baskets sliding down the wire at approximately 55 miles per hour in about half a minute." 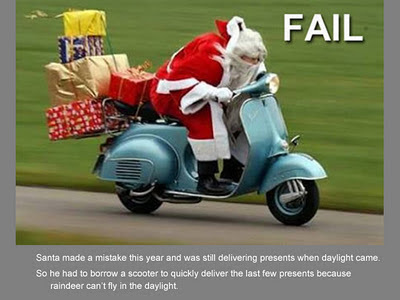 Santa made a mistake this year and was still delivering presents when daylight came. So he had to borrow a scooter to quickly deliver the last few presents because reindeer can't fly in the daylight. Kids Were Not Good This Year! 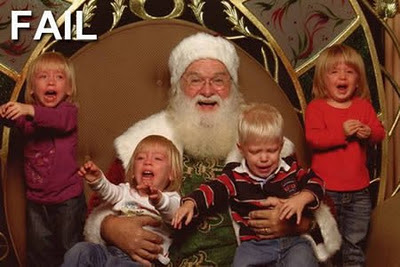 These kids were *not good this year :( :( and Santa has just told them that they won't be getting any presents for Christmas!! "While I was practicing I noticed that my cat seemed very interested in the metronome, so I placed it on the floor and here's the result!" Uploaded by ExcentricPT. - Sitcom, sketch, and standup comedy videos.